Inspired by two recent KunstlerCast episodes on Troy, New York, I thought I would take some time to explore this fascinating city myself. I spent the first several years of my life there and just returned for a wedding this past week. When the Hudson river was a main artery of the adolescent United States, Troy's location on the banks of the river was the perfect setting for a manufacturing powerhouse. That all changed, of course, and Troy became as dessicated as any other former industrial center - only, in the case of Troy, the timing was very fortunate. When more prosperous cities made decisions to cannibalize themselves in the name of renewal, Troy had to watch from the sidelines. Many of their own feeble attempts at self-destruction never really got off the ground. Today's result is a wonderful urban environment with much of its fabric still intact, some buildings restored nicely directly adjacent to others with considerable restoration potential. 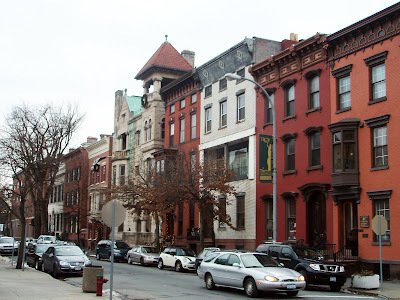 Blocks and blocks of Victorian row house are maintained. The architectural variety offers a colorful diversity while still blending together. Some newer buildings are more successfully knit in than others. A new bank, built in the Georgian style near this picture, looks like it was just dropped in from Williamsburg. Someone must have believed that as long as it was old it would fit. 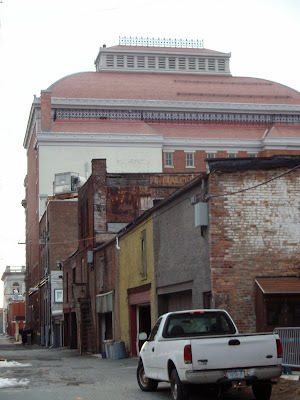 The Troy Music Hall is apparently one of the four "acoustically perfect" music halls in the world, the only one in the United States approved by Steinway for recordings. It shares the building with a bank. Service alleys like the one pictured were always a great way to offer additional connectivity. 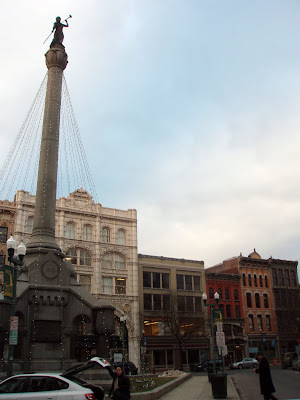 Monument square is clearly the central "living room" of the city. Also on the square, this central focal point is strung with Christmas lights. The concrete slab of a city hall constitutes the third side of monument square (Monument triangle?). It was apparently cool when it was built, but it's now being taken down. I've heard conflicting reports of what will go there. Some say open space, others a mixed-use building, or some combination of the two. 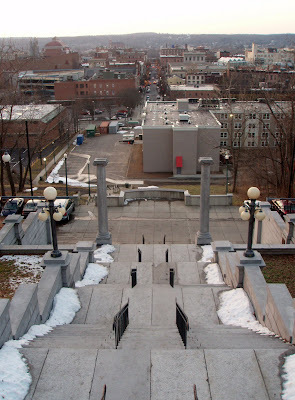 The "Grand Staircase" was once the connection between Rensselaer Polytechnic Institute (RPI) on the hill and the city. Now it dumps you into the back of a motel parking lot. The view from the top of the stairs. Notice the intentional symmetry with main street, with the off-center motel in between. 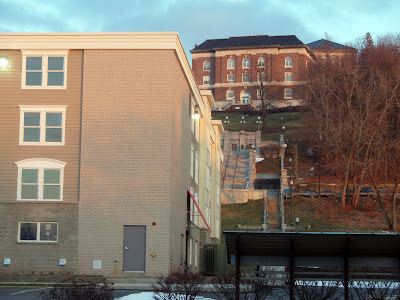 My father tells me highway engineers, in the mid-60s, wanted to run an expressway right at the bottom of the staircase. This was before the era of grassroots opposition when highwaymen got pretty much what they wanted. 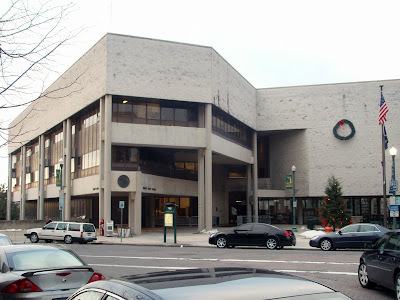 In Troy the plan apparently fizzled due to lack of finances. Thanks for the pictures. I followed a link that Duncan Crary left on the kunstlercast forum and NOW I see what they were expending not quite a thousand words on in their podcast. The pictures of the soon-to-be former city hall and the "grand staircase". Even an example from an earlier podcast in which Duncan talked about service alleys, alleys with character and utility value. Y'know, it really doesn't take that much at all to create the right space, even in an alley. Wow, that city hall makes me want to reach for the Soma (TM). The misshapen wreath draped on that moribund concrete wall might also serve as a similar totem as the American flag next to it. In JHK's words. "A flag is a sort of supernatural totem, meant to protect the bearer against animadversion and harm. We're trying to distract ourselves from the spectacle of ugliness and banality that we've created...". Happy Holidays. I'd like to cut some slack to the folks at the city hall. A flag may serve as a totem in some cases, but it seems appropriate enough to me for a government building. And the wreath at least provides some color and life to an otherwise cold and heartless wall. They don't have a whole lot to work with in this case. 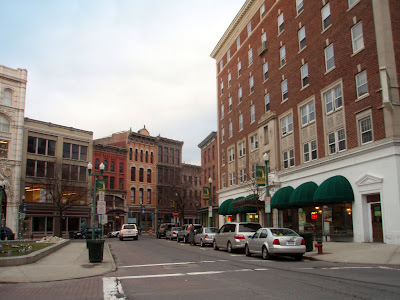 Troy looks like a great town and worth a stop if you're in the area, I especially love the first picture. How people ever just ditched places like that is mindboggling.